In Vienna, the world is calm. The city is always on the go, but never moving so quickly that those who favor a slower pace and a dreamy mindset are crushed beneath its wheels. However, this was not always the case: take for instance the socially conscious articles written by Max Winters and published around 1900 in the Berlin periodical Neue Welt and in the Arbeiter Zeitung. His pieces captured the “cave dwellers” in fin-de-siècle Vienna and gave a voice to poor roasted chestnut sellers, soda water merchants and the dwellers of mass housing in the imperial capital. Well into the twentieth century, so-called “strotters” were still roaming Vienna’s underground spaces, mainly within the extensive sewage system: bitterly poor people, often homeless, would search for reusable material floating in the wastewater. “Fat fishers” combed through the sewers for bones, fat and meat scraps which they dried and sold to the soap industry for a pittance. It was the Social Democratic “Red Vienna” that put an end to the misery suffered by vast swaths of the population. In 1918, with its construction of social housing, successfully negotiated labor laws, luxury taxes, and mass educational initiatives like public libraries, Red Vienna—regarded across Europe as a model social democratic city—began to lay the foundations for the Vienna we know today, a city often described as having the best living conditions in the world. What is that claim based upon? Certainly not just the city’s imperial relics, operas, and café culture. You don’t have to be a manager or a well-heeled tourist to live well in Vienna. Even the socially disadvantaged are able to prosper in Vienna, thanks to the city’s well-developed ability to solve social problems. And even today, in the twenty-first century, our contemporaries are dedicating themselves to social equality: passionate women and men who seek to earn a living while also generating added social value. For the past few years, Vienna’s social entrepreneurs have been hard at work, motivated by the current ecological and economic crisis. The blanket term “social entrepreneur” describes a broad range of entrepreneurial types whose main concern is not maximum profit, but predominantly social and ecological sustainability. Often enough, their cooperative, innovative approaches and solutions actually contribute to social progress. What may sound a little dry in theory and when written down in funding applications is in reality colorful, diverse, enriching, and makes sense. So let’s get out into the real world, where people like Sofia Podreka, Melanie Ruff and Kathrina Dankl are working to actively solve problems, and making good money in the process. Our guest contributor Thomas Weber lives and works in Vienna. He is a journalist, author and editor of The Gap, a magazine for glamor and discourse, and Biorama, a magazine on sustainable lifestyles. As an expert in social entrepreneurship and all things Viennese, Thomas went on a search for innovative business models with socially-minded objectives. Goodgoods products by Sofia Podreka and Katrin Radanitsch (of the Dottings design studio) can be found in the Museum of Applied Arts design shop on Ringstraße in the center of Vienna. Alongside the usual items you expect from a museum shop, they sell a small selection of design products and is one of Sofia and Katrin’s main sales partners. We arranged to meet out in the suburbs, in Breitensee. Right next to the old Sargfabrik, which was adapted in the 1990s to become one of the most exciting alternative housing projects in Europe, is one of the city’s business centers. Sofia took me to one of the tenants in order to see how her Goodgoods are hand-produced piece by piece, in the workshop of the Association for the Blind and Visually Impaired. It is all distinctly unglamorous: candles are molded, soaps are shaped, brooms and brushes bound. Some products are practical consumer goods – such as the classic horse hair Wiener Besen, the centuries-old cobweb-remover. Or the soaps that Sunny shows us with pride while we are waiting for Sofia. Sunny has been visually impaired since birth: a 23-years-old trained masseur, he has only been working here for a few months in order to learn something new. “I get by fine being blind; after all I’ve never been able to see,” he says. “It’s much more difficult for those who used to be able to see, whose whole life is turned upside down.” Sunny’s acute sense of touch is in demand when it comes to gently pouring the hot molten soap into molds, avoiding any bubbles. Goodgoods was founded in 2014, and s was the first brand in Austria to combine design with social workshops. 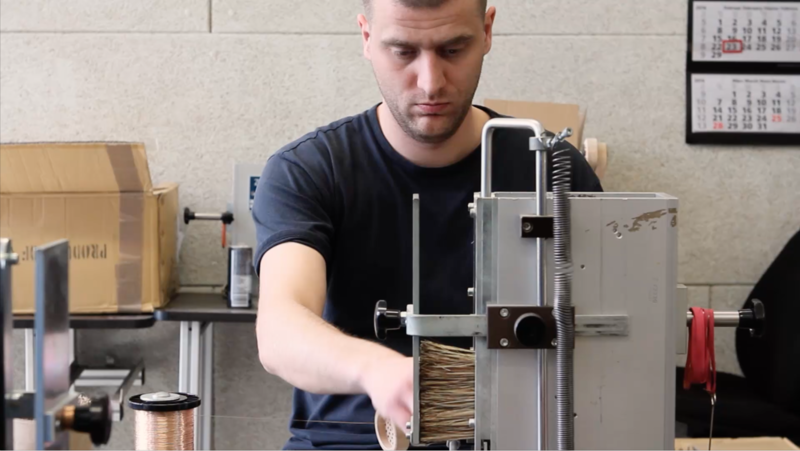 The concept is ambitious: producing unique design products in workshops for the disabled, but avoiding the assembly line objects which obviously appear to have been manufactured in a charitable workshop. That means the products should be stylish rather than just well-intentioned. She demonstrates what this means in practice by showing me a pocket-sized hat cleaning brush named Fuzz—produced in cooperation with the established Vienna hat manufacturer, Mühlbauer. Magdas opened in February 2015 and now this former retirement home has become one of the city’s hot spots, recognized internationally. This extraordinary project initiated by the Catholic Caritas organization is a social business in the fullest sense of the term. On the one hand, the centrally located hotel (redesigned and fitted out by the architectural firm Alles Wird Gut in a pragmatic yet stylish vintage style) is a classic touristic enterprise. But its employees are almost exclusively former refugees, who spend their time here, receiving training and an opportunity to integrate. Take for instance, Ehsan, 24. He fled from Afghanistan in 2009 at 17, initially to Sweden. But somehow he ended up in Vienna, and now says that “Austria has become his home.” His German (“I learned everything on the street”) is perfect. In Afghanistan he wanted to become a doctor, but here he is training to be a waiter—then, he reveals, he’s tempted to try out acting. There is also Anita from Syria, who works at the reception here in the Magdas hotel: She seems to know Vienna, the city of culture, better than most who are born here. How does everyday life in Vienna differ from what you were accustomed to in Damascus? Anita Arakelian: It’s fundamentally very similar. I didn’t come straight from Damascus to Vienna, I first stayed in a women’s home in Graz because my sister lived there for 18 years. But I wanted to move to the capital—mainly because of the city life and the internationality. I also worked in hotels in Damascus—in Le Meridien and the Four Seasons—but I’m actually a trained beautician. What I really like about Magdas in Vienna is that everything is a bit more relaxed. Damascus was less casual. I had to wear a skirt and high heels every day. Here it’s much more laid-back. Your German is impressive. Did you only start learning it when you came to Austria? I speak Arabic, Armenian, English, and German. I started learning German in Syria in 2004. When I was in Graz I studied more intensively. I took courses and watched German films every day. My next challenge is to learn Spanish. You mentioned that you absolutely wanted to move to the capital. How do you spend your time off? I love art and culture! My favorite thing to do is to visit the city’s historical museums, particularly theKunsthistorischen Museum. I love painting. I often go to the opera, especially the Wiener Staatsoper. But I’ve also been to the riding school. Vienna has an unbelievable amount on offer. Is it difficult to meet people in Vienna? I’ve been working now for two months at Madgas and we have a lot of contact with each other. I am really sociable, and we often go to events or sing our Arabic songs, but it is difficult to make new friends. Before the war I had so many plans, but I had to give everything up and start again from scratch. I have been planning a visit to Melanie Ruff’s basement workshop for a long time. Until now I’d only bumped into Melanie at events, where she would promote her ideas tirelessly. Melanie is actually a postdoc historian and before that studied to be a structural engineer at a Polytechnic University. She has combined both educational backgrounds—the technical training and her knowledge of social exclusion—with her passion for longboarding, creating a tangible business concept. Melanie aggressively advertizes her Ruffboards as “longboards made by ex-prisoners.” For her, it’s not just about cool boards and individual items, it’s an ecological and social matter. 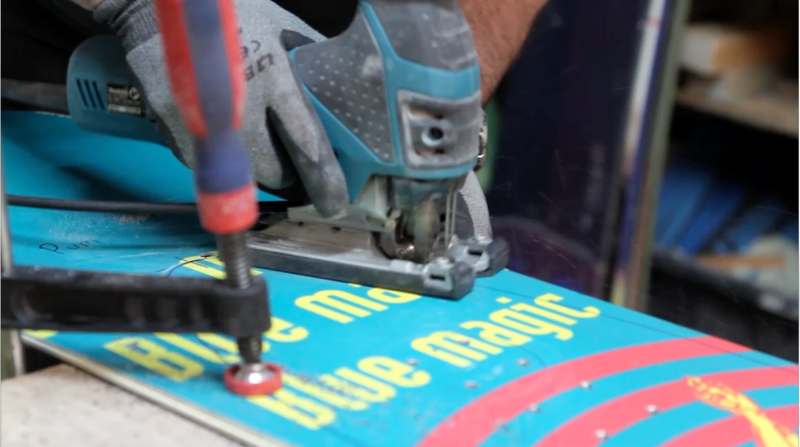 Firstly, rubbish—specifically old snowboards—are transformed into longboards. Secondly, the business offers ex-prisoners a fresh start, giving them footing on the otherwise competitive career ladder. In the Ruffboard workshop, housed in a basement in Währing, Bertl is on the phone with a ski rental shop in Tirol. The ski season has ended and the old rental boards have been discarded, meaning it is the ideal moment to acquire the sought-after raw material for the Ruffboards. “A used board costs us between 10 and 15 Euros, including shipping,” he explains. When he is not on the phone, Bertl is working away at the computer—or milling and sanding and shaping a new longboard. A father of two, he is glad to be working on an at least semi-ecological product with no waste. “The epoxy resins and synthetic fibers from old boards is the second worst type of waste out there—just after chemical waste,” explains Melanie. Her inspiration was the Freitag bags, which upcycle old truck tarpaulin. Her aim is to one day produce zero waste, to re-use all waste cuttings, making them into belt buckles for example. It’s not just the eco-boards that make the brand unique—it’s also the employees like Bertl that set Ruffboards apart. “I have a past life in prison. At some point my gambling addiction drained me of all my money. In the end I spent ten months in prison for business theft.” Thanks to his craftsmanship, his parole officer put him in touch with the association Neustart and in turn, Melanie Ruff. For a few months they worked with style-conscious apprentice craftsmen from Woodsaw to design a mobile factory. Keen boarders can bring their own snowboards to snowboarding events, surf and music festivals, to have them transformed into a customized personal longboard there and then. This concept raises another problem: acquiring the snowboards. For liability reasons, the well-known board manufacturers have internal regulations over destroying boards with defects, meaning that they have no future as a Ruffboard, and become hazardous waste before they ever even come onto the market. 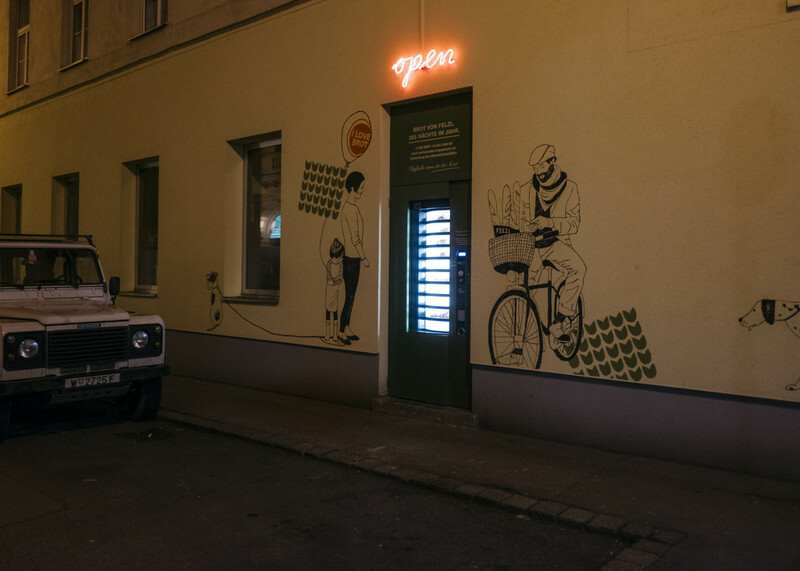 Every evening from 8pm, the long-established bakery Felzl fills an “I love Brot” dispenser in front of their branch in the Schottenfeldgasse with unsold goods. 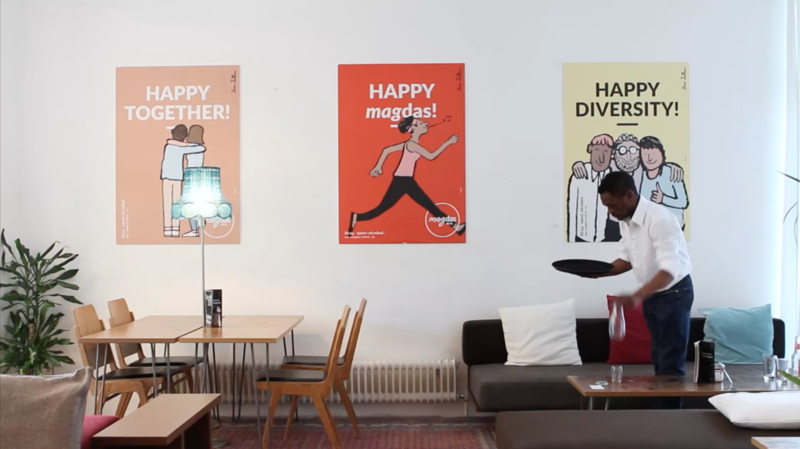 The idea came from the interdisciplinary designer Kathrina Dankl and her Studio Dankl. In 2012, Kathrina worked with food waste for an exhibition at the Werkzeuge für die Designrevolution (tools of the design revolution) at the Institute of Design Research Vienna. The food waste installation inspired her to make a concrete contribution to solving the problem. Within a short amount of time, Vienna’s bread dispenser had enriched the selection of baked goods in Grätzel. “I was the driving force, the Felzl bakery was spontaneous enough, and I wanted a team that would cover as many areas as possible,” recalls Kathrina Dankl, who became the center of the Viennese All-Star team working on the project. With sixty bread withdrawals per night, the project is clearly an economic success. And the unsold bread does not go to waste—it is baked again close by to make spicy bread chips called Felzolinis. Kathrina Dankl herself is now in Vienna only on an intermittent basis. Since 2014 she has worked as an assistant professor at the Danish Design School Kolding. Her speciality: “very experienced people.” In other words, design for an aging society. A topic which will concern us all at some point. What remains for us to do is to ensure that our world remains contemplative, not just in Vienna but all over the globe. Thank you to Thomas Weber providing an insight into some of Vienna’s exciting projects. Warm thanks to Sofia Podreka from Goodgoods, Anita Arakelian and Magdas Hotel, Melanie Ruff from Ruffboards, and Kathrina Dankl from Studio Dankl for sharing their stories. Together with the Vienna Business Agency, Freunde von Freunden explores the Austrian capital’s flourishing creative scene. The Vienna Business Agency initiated a funding competition in 2015, synonymous with the theme “social entrepreneurship.” An accompanying publication, the so-called White Paper, was published in the run-up and introduces some of the projects described here. The competition supported Ruffboards’ innovative and socially sustainable business model, among others.